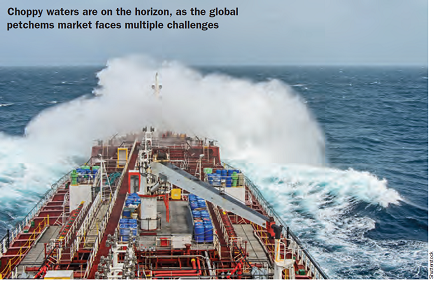 Four serious challenges are on the horizon for the global petrochemical industry as I describe in my latest analysis for ICIS Chemical Business and in a podcast interview with Will Beacham of ICIS. The first is the growing risk of recession, with key markets such as autos, electronics and housing all showing signs of major weakness. Central banks are already talking up the potential for further stimulus, less than a year after they had tried to claim victory for their post-Crisis policies. Second is oil market volatility, where prices raced up in the first half of last year, only to then collapse from $85/bbl to $50/bbl by Christmas, before rallying again this year. The issue is that major structural change is now underway, with US and Russian production increasing at Saudi Arabia’s expense. Third, there is the unsettling impact of geo-politics and trade wars. The US-China trade war has set alarm bells ringing around the world, whilst the Brexit arguments between the UK and European Union are another sign that the age of globalisation is behind us, with potentially major implications for today’s supply chains. And then there is the industry’s own, very specific challenge, shown in the chart. Based on innovative trade data analysis by Trade Data Monitor, it highlights the dramatic impact of the new US shale gas-based cracker investments on global trade in petrochemicals. The idea is to capture the full effect of the new ethylene production across the key derivatives – polyethylene, PVC, styrene, EDC, vinyl acetate, ethyl benzene, ethylene glycol – based on their ethylene content. Even with next year’s planned new US ethylene terminal, the derivatives will still be the cheapest and easiest way to export the new ethylene molecules. The cracker start-ups were inevitably delayed by the hurricanes in 2017. 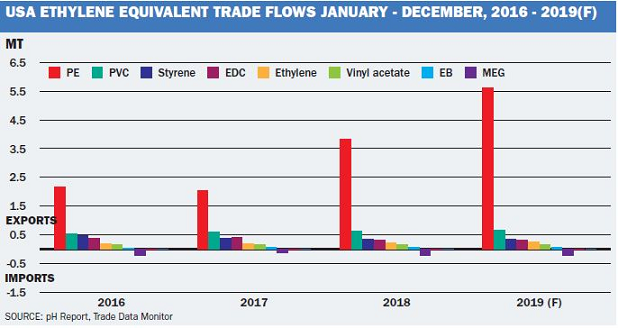 But if one compares 2018 with 2016 (to avoid the distortions these caused), there was still a net increase of 1.7 million tonnes in US ethylene-equivalent trade flows. This was more than 40% of the total production increase over the period, as reported by the American Chemistry Council. And 2019 will see further major increases in volume with 4.25 million tonnes of new ethylene capacity due to start-up, alongside full-year output from last year’s start-ups. This was not a popular message at the time, when oil was still riding high at over $100/bbl and the economic impact of globally ageing populations and collapsing fertility rates were still not widely understood. But it has borne the test of time, and sums up the challenge now facing the industry. Please click to download the full analysis and my podcast interview with Will Beacham.